Last night (January 18) we had a couple fellows give the South Vineyard Wine Guild a very interesting and informative presentation on Mead. Colin and Nathan Ryan have started a meadery in Water Valley. They are using honey from their family owned and operated honey business, Ryan's Honey, and fermenting some wonderful meads. 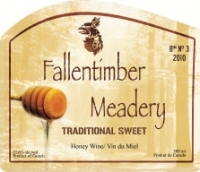 Their meadery name is Fallentimber Meadery. 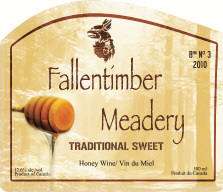 Mead is one of the oldest beverages and yet we here in Western Canada we know very little about it. My expectation was a sweet dessert type wine. But the Ryan brothers are certainly debunking that 'myth'. They brought samples of their meads,Traditional, Tradition Dry, Traditional Sweet , Cinnamon and Saskatoon berry-rhubarb Melomel which were all excellent. Proving that mead is a wine to be enjoyed by its self and/or with a meal. And it is not too sweet, but very much along the same levels of white wines.